I had just sat down at my computer to do a little writing when I heard the unmistakable sound of glass breaking from another room. I have dropped enough glasses to know the sound they make, and this was not that. It sounded like much more glass had to be involved. What had happened? Had the Christians finally come for me? I've known for a long time they would do so eventually. I mean, I am an atheist living in Mississippi. Most of my neighbors insist that a book telling them to murder me is "holy." I am thankful so few of them seem to take their book seriously. The first image to fill my head was that of a brick taking out one of my front windows to reveal a collection of local Christians armed with pitchforks and torches. As I stood up and made my way toward the sound, this image was replaced by a different one. A window would not have shattered so thoroughly as whatever I had heard. What if a ceiling-mounted light fixture had come down? That would probably sound much more like what I had heard. By the time I reached the kitchen, I could see that the windows were intact. I peered around the corner and was surprised to see that the light fixtures appeared undisturbed as well. 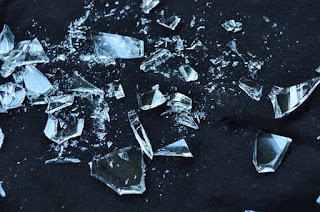 The floor of the kitchen was covered with broken glass. In fact, so were the floors of two adjacent rooms. So much glass. After realizing that I had already been walking on it, I bent down to see if I could identify the source. 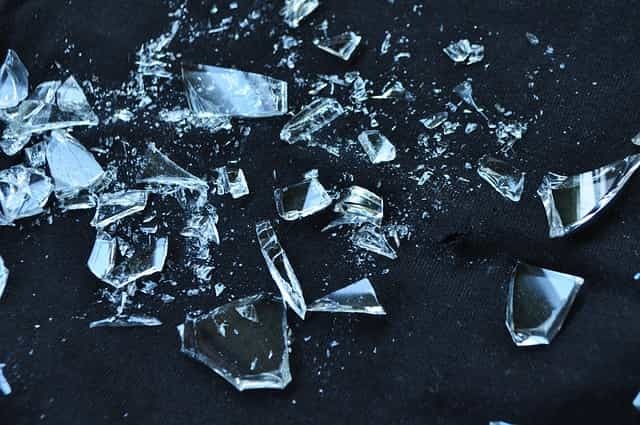 It was a large glass baking dish that had somehow hit the floor and shattered into countless pieces. But there was a problem. This particular dish had not been sitting on the counter where it could have slipped or been bumped. And even if that had been the case, nobody else was here. After picking up as much glass as I could, vacuuming, and picking up still more glass, I became increasingly suspicious. And then it hit me - I had recently washed this dish, and I had put it away. It had been in a kitchen cabinet behind a closed door. I remembered exactly where I had put it, so I checked. Sure enough, it wasn't there. This dish, safely stored within a cabinet and behind a securely closed cabinet door had somehow freed itself, fell from a great height, and shattered all over my floor. I had no idea how this could have happened. My doors were locked at the time, and there were no signs that anybody had broken into my house. And besides, who would enter, open a kitchen cabinet to break a dish, and exit before I could cross the small distance between us? There had not been an earthquake either, as I am fairly sure I would have noticed that. So what then? I think I can safely rule out Bigfoot creatures. I do not live in an area with regular Bigfoot sightings, and like I said, there was no evidence that anyone or anything had entered my home. I know what you're thinking, and you may be right: ancient aliens. They could have beamed into my kitchen, broken my dish, and beamed out before I could get there. With their advanced alien technology, they could have easily accomplished this without leaving a trace. There was a weird smell, but I attributed that to the shop vac I was using to clean up the mess. It makes that smell when I run it long enough, and there was no odor before I started running it. But still, it could have been ancient aliens messing with me. And then, of course, there is the possibility of ghosts, demons, or similar entities. Maybe I've got a poltergeist. I don't know what happened. I really don't. As I consider the various possibilities, I have to say that the idea that this dish somehow fell all the way out of my cabinet and exploded all over the floor on its own seems unlikely and not particularly satisfying. Then again, this seems far more likely than Bigfoot creatures, ancient aliens, ghosts, demons, or anything else I can think of. I am notoriously bad at stacking items in this cabinet on top of one another in precarious positions instead of putting them away properly. It is not a stretch to think that I did that here. This dish had probably been just heavy enough to fall from such a position. Does it make me close-minded to think that this is more likely than ancient aliens, demons, or whatever else? I don't think so. It isn't that I know with absolute certainty that my guess is correct and it couldn't have been one of these other things; it is just that the likelihood that the more mundane explanation is correct seems much greater.